Technology is today's need. From producing the goods and services to scientific investigations, it is required in almost each and every sphere of life. If we talk about marketing campaigns, then technology is involved here too. You remember, a few years back, print brochures remained the effective medium of marketing. But you may be surprised to know that, in today’s modern marketing world, Brochures are combined with Videos. Yes, now the traditional print brochures are coming up with video in it and known as “Video Brochures.” The emerging trend of Video Brochure and Technology is creating magic in Marketing World. Brochures are coming to life with Video Brochures and technology plays a very vital role in bringing this new kind of marketing tool in the marketplace. How the Video Brochure And Technology Works The Video Brochures are engaging and multi-sensory. 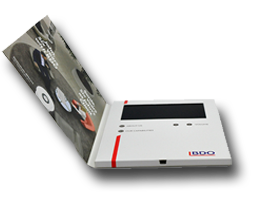 These brochures have an LCD screen inside it which communicates about your company, your products and services and other information’s precisely the way you want. In simple it provides you with touch and feels like experience with print, audio, and visual effect. Video Brochures Comes With: - Range of LCD screen sizes from 2.4inch to 10.1inch - Inbuilt motion video - Programmed with up to 10 buttons (including volume controls, on/off switch, video select, play/pause, rewind, fast-forward, etc. ), as per your requirement giving you more freedom and control over your video brochure. - USB connection to your MAC, PC, or laptop to upload video files to the brochure. Because Marketing Matters The Most PrinVido Marketing Solutions offers you with the broad range of Video Brochures depending on your needs. Get the Customized Video Brochure for your business and build a unique brand image for your business along with targeting the potential customers, associates, and vendors. 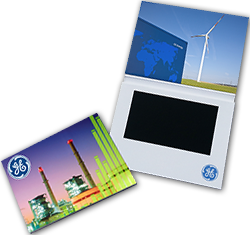 You can see the technological impact not only in Video Brochures but Video Business Cards, Video Gift Boxes, and Video Presentation Boxes too. Personal occasions, corporate gifting, image building, marketing, or promotion, Video Products with the technology involved in it, serves you for every opportunity. Functions And Specifications Of Video Brochures PrinVido offers you with more flexibility and freedom with the most advanced technological features and usability functions. Video Play: Up to 4 hours of video can be stored on a single brochure. Buttons: You can have up to 10 buttons like on/off, play/pause, rewind/forward, and volume up/volume down.